A controversial autobiography about the Japanese colonial occupation of the Korean peninsula will not be removed from Hawaii public schools, but teachers assigning the book must warn students that its portrayal of the end of World War II has been disputed. Last week, the state Department of Education asked schools for feedback on the book "So Far from the Bamboo Grove" after the Korean Consulate raised concerns about the text. The consulate argued that the book, written by Japanese-American Yoko Kawashima Watkins, distorts history and frames Koreans as villains without giving proper background about the two countries. 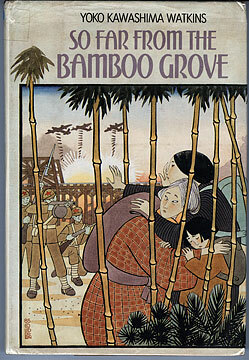 The book cover of "So Far from the Bamboo Grove," by Yoko Kawashima Watkins. Only a few schools replied to an e-mail sent by Schools Superintendent Pat Hamamoto, and all said the 183-page book had not caused any problems with teachers, students or parents, said Greg Knudsen, spokesman for the department. Knudsen said that while "the debate is probably going to continue," for now the department is simply reminding teachers who opt to use the book to comply with a Controversial Issues Policy that has been in place for decades. According to the policy, "Teachers shall refer students to resources reflecting all points of view. Discussions, including contributions made by the teacher or resource person, shall be maintained on an objective, factual basis." In her autobiography, Watkins describes her life as an 11-year-old Japanese girl fleeing a city in north Korea to Japan in 1945. Critics say the author ignores atrocities committed against Koreans by the Japanese from 1910 to 1945. The controversy has led to the book's removal from schools in New York, Massachusetts, Texas and Rhode Island. There are at least 150 copies of the book among 140 isle schools. It is listed as a fictionalized autobiography in libraries and is also among thousands of titles available in an Accelerated Reader Program, a service to which several public schools subscribe. Dong Yern Kim, deputy consul general with the Korean Consulate in Hawaii, said he was glad the department had reviewed the book's use. The consulate understands that students have a right to read what they want, but it objects to having Watkins' book taught as history, he said. "Any class which covers that book, they definitely have to explain to students the background of the situation," Kim said. "That is fair."